A death coach is expected to counsel patients experiencing life-threatening illness. 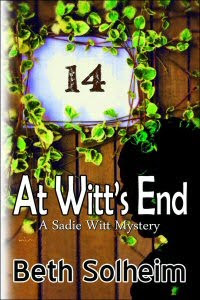 But that’s not the case for sixty-four year old Sadie Witt, owner of the Witt’s End Resort, because her clients are already dead. They checked into Cabin 14, where no guest leaves alive. Her guests will be shocked to learn that the flamboyant Sadie is their conduit to the hereafter. Clad in the latest fashion trends (fads that are typically reserved for those without sagging body parts) and sporting hairdos that make bystanders want to look away but can’t, Sadie realizes that one of the guests had been murdered and must work against the clock to untangle the web and prevent further mayhem. Five guests, all with hidden agendas, must help Sadie solve the murder and protect the mysterious contents of a black leather briefcase. They are ill prepared for the unorthodox manner in which this colorful woman leads them on their final journey.